Sustaining Members are individuals or families who contribute ANY amount above their standard dues. 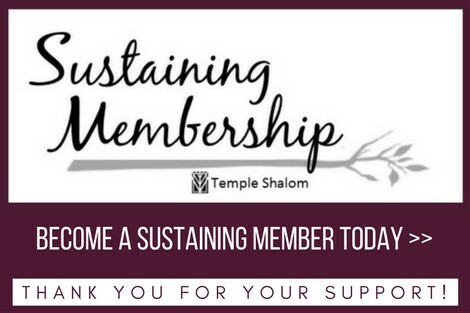 The Sustaining Membership program enables Temple Shalom to welcome all who want to join our community to do so regardless of their ability to pay and to continue to offer exceptional programs and activities for our members and the community. Last year, we collected over $170,000 from 169 Sustaining Members, and this year we hope to increase that number to $200,000 from 200 Sustaining Members. Every dollar donated helps support members who cannot pay dues and strengthens programs in all areas. We appreciate your support of Temple Shalom.